Dan Bilbrough a.k.a Sekrit is a drummer, percussionist, composer and producer. 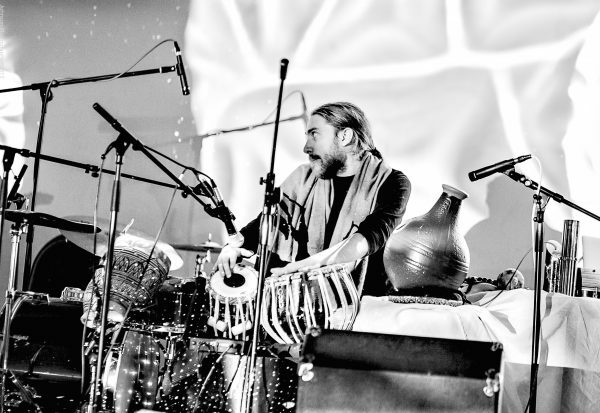 Dan was first introduced to the drums at the age of 8 by his classical percussionist mother; little did he know where that journey would take him. Being the son of a traveling gospel folk singer/songwriter certainly ensured that the journey would (at least geographically) be far and wide as he accompanied his dad on various travels across many countries. The inevitable result is that the music that he has observed and enjoyed from around the world has impacted his playing styles. Dan has gone on to broaden his influences into his musical style, which include authentic sounds and rhythms combined with hip hop beats. This is reflected in his Sekrit projects which have received airplay on radio stations such as Rinse FM, Worldwide FM and Soho Radio. Dan has led drumming workshops for a number of years including working with Inspire Works, an occasion which led to Dan teaching material and helping to lead both the worlds largest samba band and the worlds largest drum lesson. Both achievements are Guinness World Records. Dan has performed and recorded with the likes of Brit Award nominee Beth Rowley, Vanessa Freeman and the All Souls Orchestra, top musicians such as Raul D’Oliveira (trumpet player for Sting, George Michael, Gloria Gaynor), Steve Gregory (Sax player for George Michael’s “Careless Whisper”), Dave Markee (Eric Clapton’s former bass player). He has also performed at some of the U.Ks finest venues such as the Royal Albert Hall, Jazz Cafe’ and the Union Chapel as well across Europe and Asia. Dan brings a vast wealth of skill and experience to UNVEILING 2018. We are delighted to welcome him as a (drumming) workshop leader.